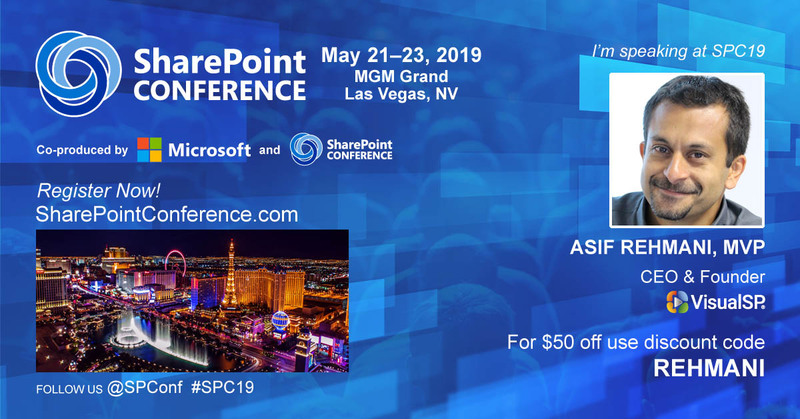 As sponsors and presenters at the SharePoint Conference, we want to let you know we will be there and hope to see you at the conference! There’s a lot coming with the 2019 SharePoint Conference. You will be one of the first to hear about Microsoft's vision, roadmap, and latest innovations across OneDrive for Business, SharePoint, Yammer, Microsoft Teams, Stream and Office 365. Our CEO Asif Rehmani will be hosting two educational sessions. There's so much that Office 365 has to offer small to large organizations. However, the current reality is that most organizations are only using about 20% of the available capabilities. Why not understand the entire value of the suite of Office 365 applications so your users can take full advantage of what you are already paying for? Come to this session and we'll go over the entire stack of Office 365 applications. Not just what each of them do, but also the sample business use cases. So you have decided to migrate to the new version of SharePoint or Office 365. But what about your end users? Are they ready for the change? Organizations around the world have been discovering that to realize their return on investment, they must take into account how they migrate their users along with their systems - No end user left behind! He’ll also deliver a product-centric session focusing on the benefits, use cases, customer examples and product demonstrations of our VisualSP Real-time, on-demand help for SharePoint and Office 365 solution. Give a man a training class, and you help him for a day. Teach a man to use VisualSP, and you help him for a lifetime. Thoroughly training SharePoint end users is an expensive waste of their time and yours! Instead, provide users the context sensitive, on-demand help they need when and where they need it most - while performing their tasks. Discover how over 2 million end users worldwide are utilizing this technology. We'll share proven strategies to eliminate support phone calls and emails, freeing your team to once again focus on productivity, not frustration. Our solution will help your users on-demand, exactly when they need it and we'll demonstrate how showing VisualSP in action with real-world scenarios. VisualSP is offering discount promotional code for the conference, simply enter “REHMANI” when completing your conference registration and save $50! SPC19 is more than just presentations. Join us in the community, visit us in the expo and step into the fast-track with those who are changing the paradigms of how people and information interact within the changing world. Meet tomorrow's movers and shakers. Create lasting friendships and partnerships as powerful as the experiences you'll have.